There are two types of limited companies in the UK— a public limited company (PLC) and a private limited company (Ltd Company). The most popular business structure is a private limited company (Ltd Company). What makes a private limited company so popular? Despite the limited company formation process and requirement for more paperwork, Limited companies give invaluable protection from potential liabilities to the owner. Limited companies can distribute profits to its shareholders by way of dividends, saving on National Insurance contributions. There are also advantages when the profit are remitted and gives an opportunity to the owners to manage their cashflow for income tax payments. What are Limited Company registration requirements? Limited company registration requires a minimum of one shareholder and a Director. Legal entities can be shareholders and directors of Ltd companies in the UK, but at least one Director must be a person. Duties of the Limited company Director are, but not limited to act within powers; promote the success of the Company, exercise care and due-diligence; not to accept 3rd party benefits. A Ltd Company in the UK no longer requires a Secretary appointment, but the duties will be on the Limited company Director in the absence of a Secretary. A UK registered Limited company must have a registered address in the country of registration. 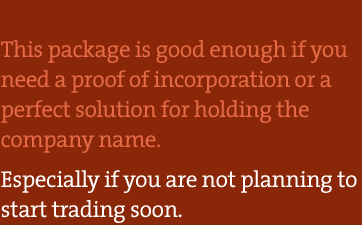 This address cannot be a PO Box, it must be a real address, not necessary your trading address. Some Limited companies use their company formation agents’ addresses. We provide such service for a small fee. 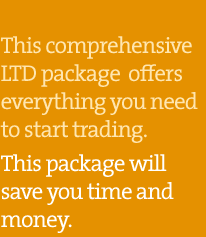 Please see Setting Up a Limited Company. Limited company formation can be completed in less than 3 hours (subject to Companies House workload and order submission before 12 noon). 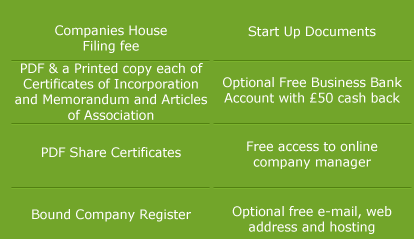 Limited company registrations nowadays are mainly completed electronically online. 95% of ltd company formations are set up through company formation agents. 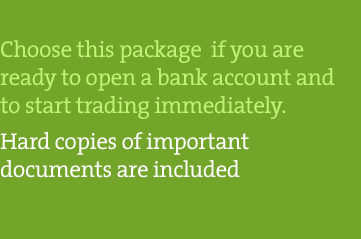 Ltd company registration by the method of paper filing can take up to 4 weeks. Limited company formation in UK is governed by the Companies Act 2006. 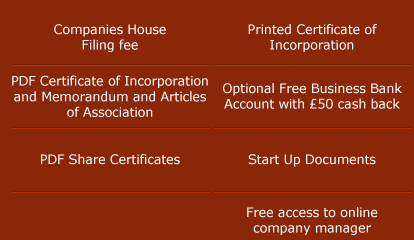 The main Limited company registration documents are: a Certificate of Incorporation, a Memorandum and Articles of Association and a Company Register. Once your company registration application form is submitted to Companies House, we cannot recall it or give you a refund. 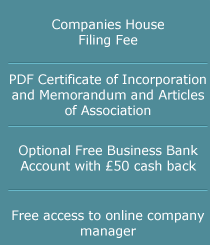 UK Companies Limited pays the filing fee when the limited company formation application is submitted and Companies House does not refund the filing fees. Limited company registration restricts the use of certain Ltd Company names mainly due to their duplicity; government affiliation suggestion or being offensive. The words which are classed as sensitive for company formation purposes include but are not limited to: British, Group, National, International, Holding (s), etc. Limited company registration with Companies House ensures that no one else can register a limited company with exactly the same name. Your Limited company formation can be delayed, if you chose a sensitive name as the Companies House will require supporting documents from you.